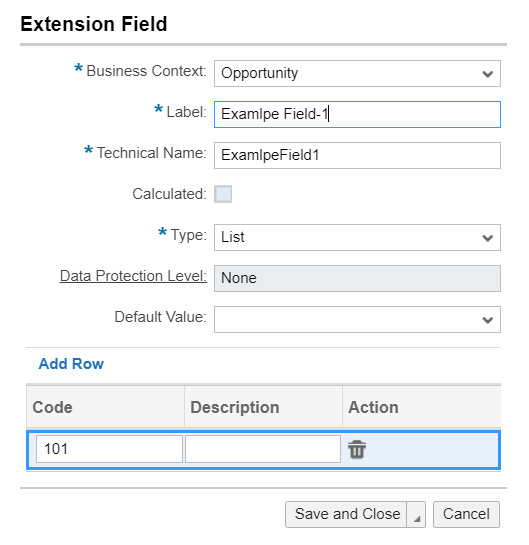 SAP Cloud for Customer allows Key Users to create Extension fields of type List and Multi Value List through KUT Adaptation changes. Fields of type List and Multi Value List appear as Drop-Down Lists on the UI. Fields of Type List allow End Users to select one value from the Drop Down List at a time. This blog shows how to create such fields and maintain values for them. Click on Download and save the .csv file . Add entries in .csv file. Make sure that you do not change the order of columns or change the names of the column header. Add Code and respective description for each language maintained. Save your changes as CSV (Comma Delimited). Navigate back to Field Definition screen, click on Upload and you get a popup to select a csv file from your local PC. Click on Save. The upload gets triggered and the values are uploaded. Now you can go out of adaptation mode and you can see the values in dropdown after the upload. Only Alphanumeric Characters and 2 special charaters are allowed as value for Code and Description i.e Alphabets, Numbers, Hyphen (-) and Underscore (_). Make sure that the format of csv file is not changed and add the values in same format in columns ABCD. Values in Columns ABCD should not be interchanged. Make sure that the description does not exceed the data base length which is 128 characters. When you save the csv file after adding new values, save the file with.csv extension with comma delimited. If there are multiple languages defined by key user, then Screen texts should be maintained for all languages and the descriptions as well to be maintained for each language (EN, DE, FR etc.) . If any value is inconsistent then upload will not work. No delta upload can be done. Always download the existing values from Field Definition and then update the existing one or add new entries in the excel, after that, upload the excel with complete list. At any point, only 1000 code values are allowed. If a key user tries to upload more than 1000 code values, then an error is thrown saying “Upload failed; the code list value has exceeded 1000 entries”. Field definition can hold maximum 300 code values and more than that the code values will not be visible in field definition instead you will be able to see all the values upon Downloading the CSV file.